TALLAHASSEE, Fla. — Heads hung low, Notre Dame was stunned. Players moved slowly to the tunnel of the opposite end zone. While Doak Campbell Stadium roared, the Irish were silenced. Notre Dame had just topped the Seminoles — the defending national champions. Against the Heisman Trophy-winning quarterback. On the road. But an offensive pass-interference penalty negated the touchdown. Florida State won. We could debate the call. We could debate the value of moral victories. We could debate Notre Dame’s chances of a trip to the College Football Playoff. There’s no debating Notre Dame is for real. Doubts surrounded this Irish team the way #BlameJameis signs enveloped the College GameDay scene. Notre Dame hadn’t played anyone. Notre Dame couldn’t run the ball. Notre Dame got shredded by North Carolina. Some of the criticisms were warranted; some weren’t. None of that matters now. Because for 60 minutes, Notre Dame went toe-to-toe with Famous Jameis, the ‘Noles and the simple-yet-seductive war chant. The Irish outgained Florida State, 470-323. The Seminoles grabbed their first lead with just 7:39 remaining in the fourth quarter. 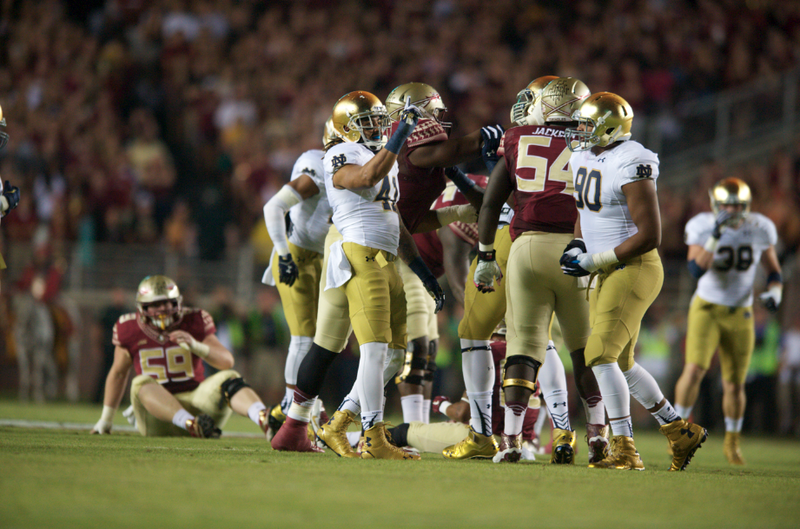 Notre Dame punished Florida State in the trenches. Notre Dame did everything except win. Notre Dame’s players were confident. Ardent Irish supporters were confident. But who else was sold on the Irish? Apparently not “the world.” Between Everett Golson’s turnovers and the youth on defense, there were still unanswered questions. All the off-the-field and on-field noise that had followed both teams throughout the season funneled in through the Doak Campbell Stadium tunnels and exploded into a raucous environment for three hours and 27 minutes of entertaining, competitive football. But the Irish refused to let the never-ending war chant deafen them. Notre Dame answered all the questions. The players and coaches knew the answers beforehand. The studying was done. It was just time to teach everyone else. Notre Dame is an elite team. It isn’t a year ahead of schedule, although it can return nearly every starter next season. This is the new schedule. A playoff berth is within reach. Kelly had his players truly believing they could win. Every time this season he’s been asked if he is “surprised” by his team, he says no, in so many words. He says he always knew the potential was there. Asked if he has been surprised at any point this season, Irish junior defensive end and captain Sheldon Day followed Kelly’s lead. For the first time in a long time at Notre Dame, the Irish might be surpassing expectations with their performance. But the Irish themselves aren’t surprised. They expected to win. “We needed to make one more play,” Kelly said. Notre Dame did — then it hadn’t. But that penalty — that controversy — changes little. Notre Dame proved itself Saturday night, and a season of opportunity lies ahead. “Just keep your head up,” Golson said of his message to teammates.